The island of Borneo, located just south of the tip of mainland Malaysia, is a natural wonderland. Most visitors come to dive or see the island’s unique wildlife, but the flora has a lot to offer too. During my stay at Sepiilok Nature Resort in the Malaysian State of Sabah, I spent one afternoon exploring the boardwalks that border the lake and marshes around the resort. One of my finds were enormous leaves of this Borneo Giant Elephant Ear that stood taller than me. They rippled in the sunlight like waves on a green ocean. I was mesmerized. Interested in learning more about the exotic island of Borneo? Read about my visit to the Sepilok Orangutan Rehabilitation Center, the Bornean Sun Bear Conservation Centre, and my day trip to the Kinabatangan River to see proboscis monkeys in the wild. Oh wow! I wonder how I would look beside it. I felt like an ant next to it! LOL – They were absolutely immense and I have to admit to feeling very small beside them. Huge and impressive. Must be some kinda sight to enjoy in the jungle. 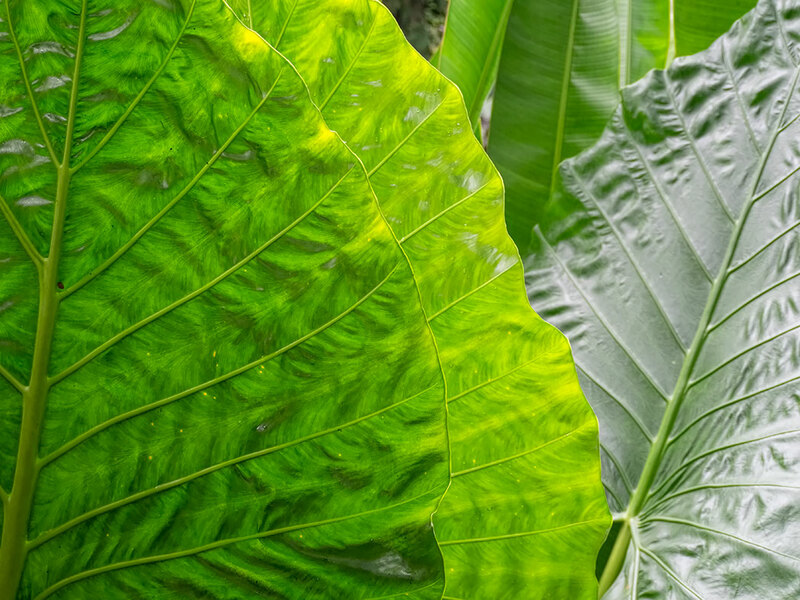 Those Elephant Ear leaves were as tall as houses in some cases, Ryan! Your text sounds wonderful but the wonder is absent from the photograph! For all we eager-to-view(ers) know from top to bottom we’re looking at four inches of leaf. We need something of unambiguous dimensions in the picture to provide a sense of scale! Ah yes, I hear you James. But sometimes I shoot for texture and light, rather than perspective, and this was one of those times.